Spring has sprung -- which means it won't be long before you're hosting an Easter buffet, making Spring Break plans, or attending a backyard barbecue. After the chill of winter, most of us enjoy these longer days and warmer temperatures. But more get-togethers often means more challenges for those watching what we eat for weight management or other health-related reasons. So how can you enjoy guilt-free without eating like a rabbit? Low carb, low calorie, and gluten-free shirataki noodles and shirataki rice can be life-savers when it comes to creating healthy sides. Used in place of pasta or white rice, fiber-filled shirataki helps satisfy hunger (and the craving to slurp noodles) without extra calories and carbohydrates. For this month’s featured recipe we chose our Skinny Noodles Salad because it's a fast, easy, and delicious way to create a healthy side dish for the next Spring buffet or potluck. Hop over those other sides without feeling deprived. If you're tired of using the typical spaghetti shirataki, jazz things up with our new Skinny Ramen. It's a fresh twist on regular spaghetti that will have everyone singing the praises of light, healthy eating! 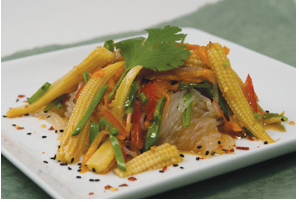 Worried about preparing shirataki noodles? Watch our Chef Tommy make Skinny Noodles Salad in the video below. In large bowl add noodles, carrots, snow peas, red bell pepper, and baby corn. Whisk soy sauce, oil, sugar, garlic powder in a bowl until well combined OR use 1/3 cup of ready-to-use dressing. Pour over noodle salad, toss gently. Cover and refrigerate for 1 hour before serving. Visit us at www.getskinnynoodles.com to learn more about shirataki noodles, get cooking tips, and explore all of our shirataki noodles recipes! Skinny Noodles Shirataki are the low carb, low calorie, gluten-free alternative to regular pasta and rice. Made from an Asian root called konnyaku (konjac), Skinny Noodles Shirataki are available in six types: Spaghetti, Angel Hair, Spinach Fettuccine, Macaroni, Rice, and Kale Spaghetti. All varieties are gluten free, soy free, vegan and Kosher certified; paleo, weight loss, and diabetic friendly. All products are proudly made in America. Shop now at http://www.GetSkinnyNoodles.com! Get 10% Off + FREE Shipping on your first order with code FIR10. Some exclusions apply.